The small community of Port Wing offers up big vacation opportunities. Two historic churches and a restored saloon serve as art galleries in the center of the village. School Memorial Park is adjacent to the Port Wing Heritage Hall which showcases the commercial fishing, logging and sandstone mining history of the area. Quarry Point and Big Pete Boreal Protected Areas invite exploration. Twin Falls Park provides picnic tables and is an easy hike to the falls. Enjoy the pristine public beaches and boat launches. Buy some locally caught Lake Superior fish, or dine at a local eatery. A highlight of a visit in the late summer is the "Labor Day Fish Boil" and "Lions Club Fall Festival". The Port Wing Area Business Association welcomes visitors to come shop our unique stores, explore our public beaches, fish our harbor and trout/salmon stream i.e. the Flagg River, stay at one of our local Bed & Breakfasts, tourist cabins or camp grounds, and take the opportunity to launch your boat, canoe or paddleboard. Come jump in the Lake! Experience Lake Superior. Port Wing is located on the "Wisconsin Lake Superior Scenic Byway", State Highway 13 mid-point between Superior, WI and Bayfield, WI. 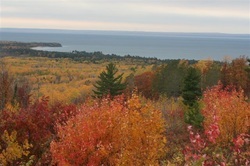 and is also part of the "Lake Superior Circle Tour". More information on these events and more on the Port Wing website.